This organizations sounds amazing. I need something like this here in Atlanta. Do you know of any similar groups here? I love the graphics. this site is beautiful! there is a real happiness to it. or should I say, its very POZitive! Obviously no group can be for everyone. We are a topic driven group. That means that each week we choose a differenct topic to discuss. You chose to attend the week where our topic was Social Security Disability. It should be no surprise that people attending that week were not working and were discussing Social Security Disabilty. I would like to point out that having HIV is never a “gravy train”. People may look healthy, yet still suffer from painful debilitating neuropathy, bi-polarism or dozens of other conditions. Attending one meeting would not make you privy to any of those conditions. But our group also has rules and not judging other people is one of the rules. If this is a rule you cannot live by, then we’re not the group for you. 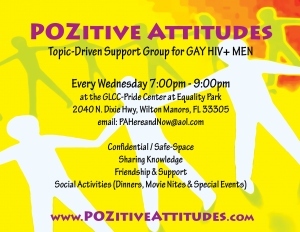 There are many other HIV support groups in Ft Lauderdale. Here is a link to them . The LIFE program is a very positive experience for many HIV positive guys and is set up Tuesday evenings to accomodate working guys. If none of these groups work out for you, give us another try. But remember, we don’t judge each other. That’s the way our support group works. I apologize for posting here, I can’t seem to find an e-mail for our fearless leader, Steve. Here’s my question: are any of the group members NOT on meds for their HIV? I would like to do a story about people who choose not to be on meds, either because they remain healthy without them, or have chosen other therapies, or whatever the reason. Could someone help me identify local folks to talk to about this? Thanks. Hi, I’m moving to Florida and am looking forward to meeting with your group.